Anna Hills was an active member of the Laguna Beach art colony and co-founded the Laguna Beach Art Association, serving as several terms as president. Anna Althea Hills attended Olivet College in Michigan, the School of the Art Institute of Chicago, and the Cooper Union Art School in New York City. 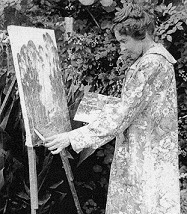 Born in Ravenna, Ohio, Anna Althea Hills was a prominent California landscape painter who was also remembered as a civic leader in Laguna Beach. Anna Hills was raised in Olivet, Michigan, and attended Olivet College. She studied at the Art Institute of Chicago, Cooper Union in New York, and privately with Arthur Dow. After further study at the Academie Julian in Paris and traveling throughout Europe for four years, she moved to Laguna Beach in 1913 and was painting in Arizona as early as 1914. The landscape of the West inspired her to adopt a light, colorful Impressionist palette. In spite of a severe spinal injury, Anna took adventurous painting trips into remote mountain areas. She also supervised a Sunday School for ten years, and was a six-year president of the Laguna Beach Art Association and helped raise funds to build the existing museum. Anna Althea Hill's early works of genre and interiors were much darker than her later California landscapes and marine scenes. She combined watercolor and oil and painted in a decorative style. A.A. Hill's Biography courtesy Edan Hughes.